Another race in the bag! This one I’ve really been looking forward to because there’s nothing better than running in your hometown right?! 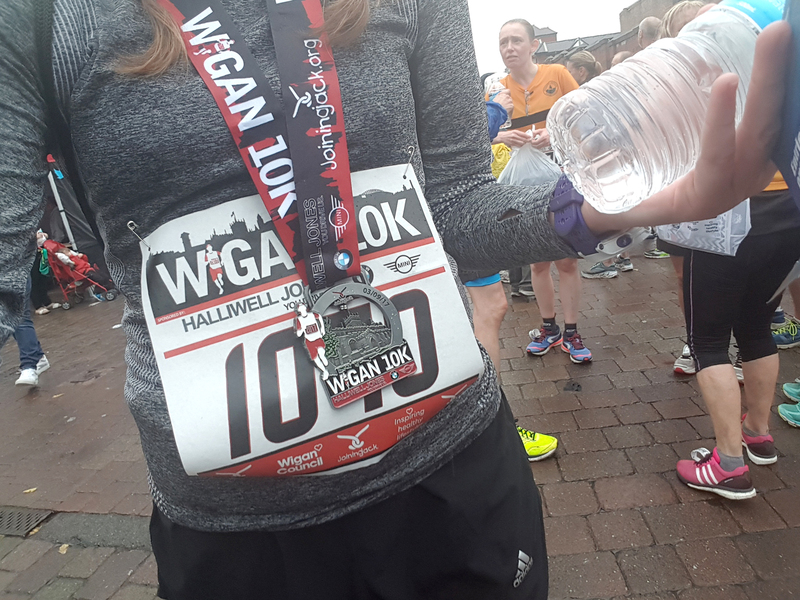 Last year I ran the Wigan 10k in 01:00:33. Since that race, I’d been trying to get sub-60 and I finally managed it in April with a 59:53 10k. Not much under 60, but under nevertheless. 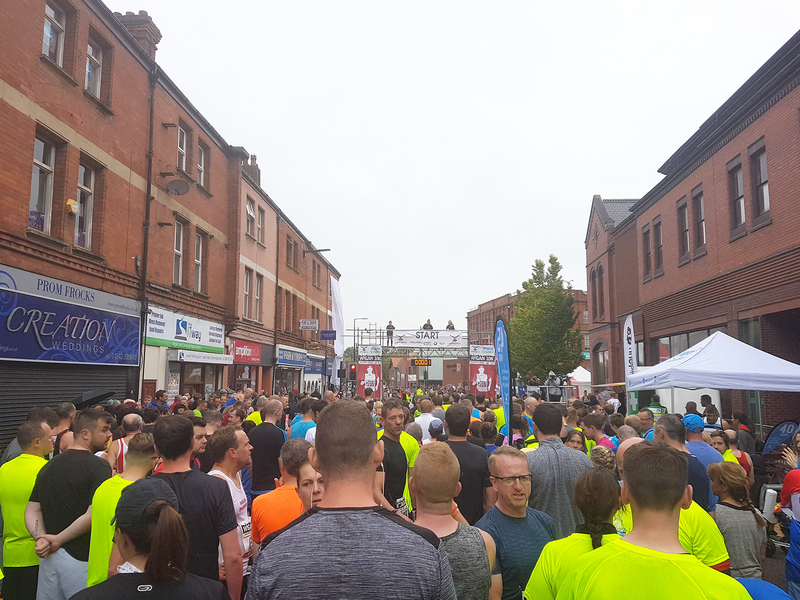 I didn’t do a 10k again until August with the Dreamtrail 10k, and well, that ended at 68 minutes. So I knew I wanted to really push for a PB on this one… And push I did! This race doesn’t do staggered starting, so this year I wanted to try to get myself closer to the starting line. They do take both the race start and your chip start into consideration, so timing wasn’t an issue – I just knew from past experience that starting further back means a slower start. I wanted to be off from the get-go! Typically as it was taking place in Wigan, the rain started just as we were all herding into the starting pen. 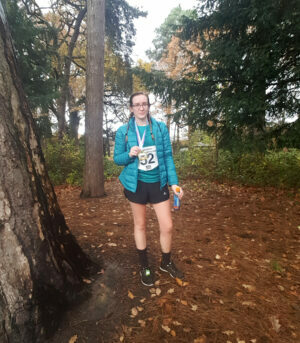 I was glad by that point that I’d opted to wear the long sleeved top instead of a vest because I was bloody freezing waiting for the start! We were in there for around 20 minutes. It rained all the way throughout too. Not too big of a deal seeing as I got warm running, but annoying. I was stood very close to the 45 minute pacer. I knew without a doubt that he’d be soon off into the distance, and the 50 minute pacer would also pass me by quite quickly. That was expected. The good thing about starting with the faster people is that your pace gets quicker, and feels a little more natural. Or at least it does for me, because I get in sync with others around me. I finished the first 5k in under 29 minutes, which is actually probably the fastest I have done that distance – at least in a good while. I was keeping an eye on my pace at every kilometre, and I knew I was generally hitting around 5:40, which I knew would give me a little leeway if I did slow down towards the end. For a 60 min 10k, you basically need a 6 min/km pace and I knew I was on for that. I was actually a little worried that I’d started too fast, but in all honestly it didn’t feel that bad at all. I was enjoying it! Actually it was probably only around this point when the 55 minute pacer appeared and overtook me. Support on the course is always great. We run past a lot of houses, so there are always people stood outside cheering you on. As I mentioned above, around the half way point we arrived at the DW Stadium, and some of the first team players were stood waiting at the water stand to hand it out to us. I love that they do this – they don’t have to! That said, I didn’t actually take any water. They were handing out full bottles and I didn’t want to take so much. 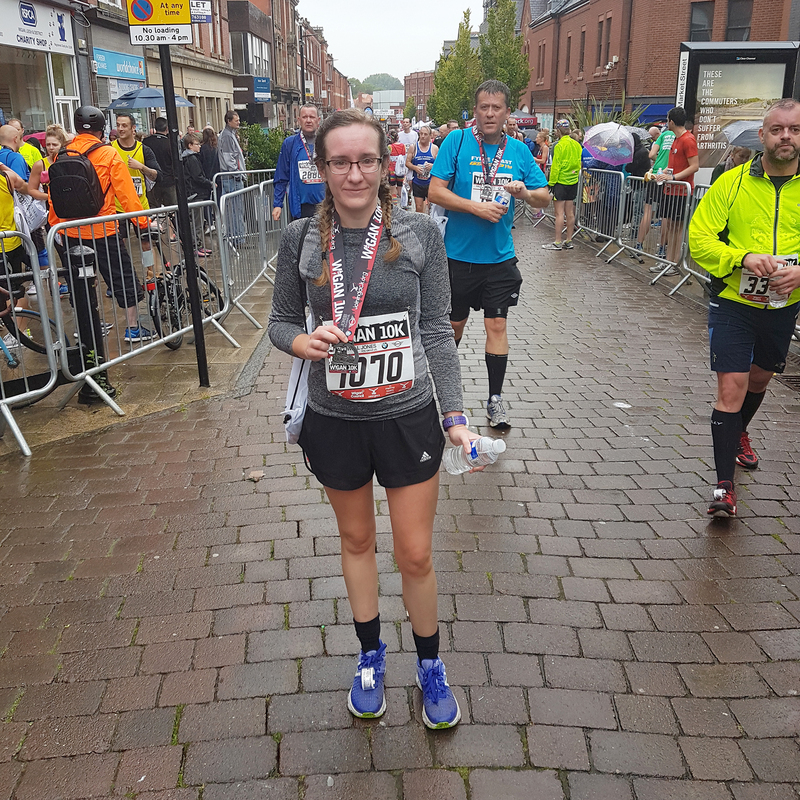 And I knew I didn’t really need it – I was well hydrated (this time!) in preparation. The route back was almost the same as going, with two little detours – one through an industrial estate, and the last bit through the park. It meant that you knew exactly what was coming, and for me that always makes it easier. I could feel myself tiring, but I knew I had it in me to keep at the pace I was at. On our way back, the lovely Lynne and Pat had their little stall ready with water to be handed out. They do it every year, and honestly it helped me so much this time. They apologised for not being able to hand it out really quickly but in all honesty I didn’t mind the few seconds I stopped for. Apparently they handed out over 600 cups! How amazing is that?! I did start flagging a little around 9k, it felt like my thigh was cramping up, but the park is always such a great bit at the end. SO many people were here, and it made that last little hill just a bit easier. Once you’re out the park, you’ve just got to go round a corner and then the sprint finish is there. And sprint I did! I managed to get back with a chip time of 58:11, and I am still so, so happy about that. I’ve knocked over a minute and a half off April’s PB time, and any runner will tell you that a minute can feel like an hour. I’m just happy to be under 59 minutes, when in February I could even get under 60. More to come from here! Also look at that medal, isn’t it a beauty! 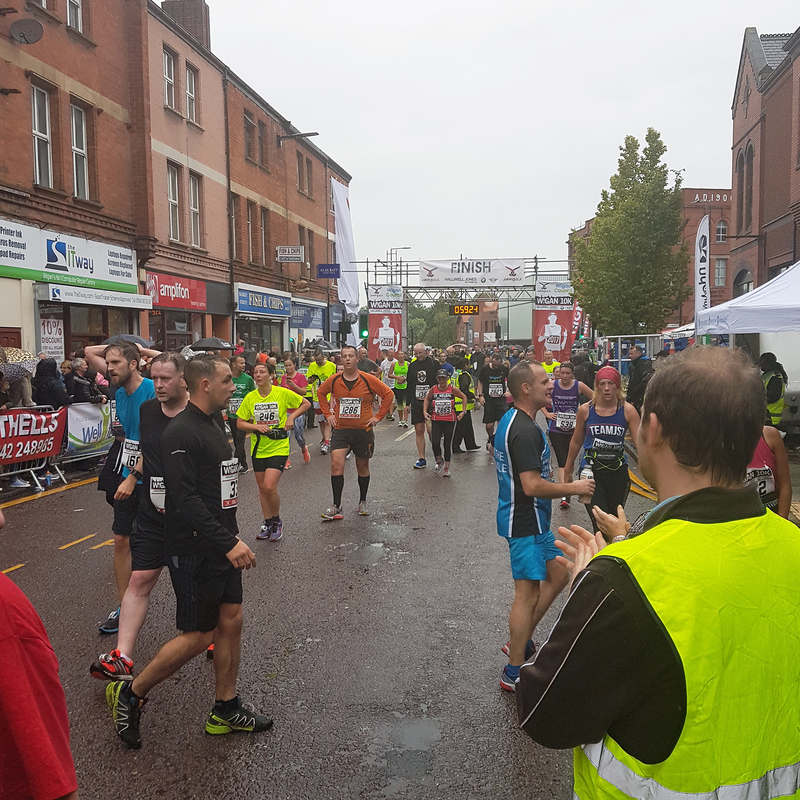 Next up is the EHM which includes a 5k on Friday 15th, half marathon on the 17th, and a mile run also on the 17th. Yes I’m signed up to do all three. Yes I’m crazy. Keep an eye out for that recap!